For Valentines Day, my boyfriend and I decided to splurge and dine at Rockpool Bar and Grill; upon reading countless raving reviews on our favourite food bloggers. Personally, as a steak-lover, I was overwhelmed to see the extensive options on Rockpool's menu. However, the thought of spending $115 on a steak, no matter how fancy the name-David Blackmore's Dry Aged Full Blood Wagyu Sirloin-seemed a little extreme. As a result, my boyfriend ordered the Cape Grim Dry Aged Fillet ($55) and I ordered the Cape Grim Dry Aged Scotch Fillet ($49)-medium rare. 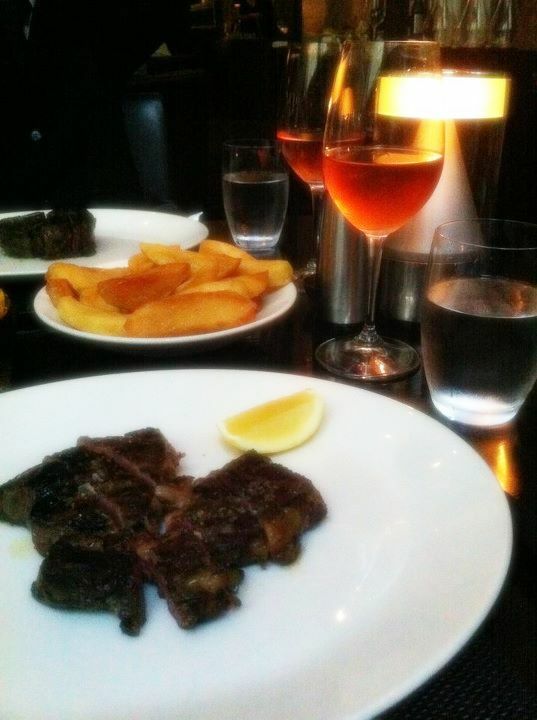 Both the steaks were AMAZING-currently our favourite steak in Sydney so far. Each cut of the steak was done with ease as the meat was a succulent bite of tenderness and delight. Usually, I prefer my steak with a sauce so that it does not come so dry however in this incident, even with minimal sauce, each bite was just absolutely delicious. Through the comparison of the two steaks we ordered, I would say there isn't a huge difference in taste however, I did think my boyfriend's Fillet was slightly more tender. For dessert (unfortunately, I have deleted the photo), we ordered the Black Forest Trifle ($25, inspired by The Fat Duck's BFG) and it tasted great with its layered texture of thick cream, chocolate and hints of raspberry. Overall, the experience was wonderful as the service was attentive and the food was absolutely worth the price paid. The ambience of the restaurant exudes that of a American styled decor with simple but elegant interiors. We loved the place so much that last week, we revisited Rockpool-however, this time, we went at lunch to try out the famous Wagyu Burger ($24) at the Bar. The burger may not appear so large on picture however in reality, it was quite overwhelming in size. As I took in the first bite, the souffle-like texture of the bun with a thin crisp of crunchiness on its shell was a delight to the senses and the juicy patty (medium rare recommended) was cooked just right with a shade of pink inside. It was definitely worth the visit on both occasions and is a restaurant I believe I will return to for special occasions in the near future.